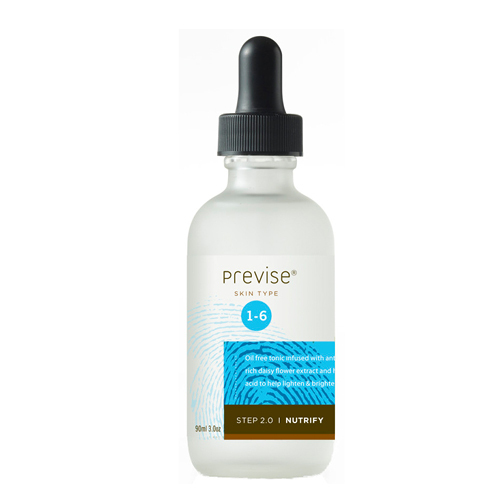 Nutrify Tonic by Previse SkinCare is an innovative and easy-to-apply brightening skin toner formulated to deliver the ultimate feel of smoothness for all skin types. Vegan, gluten and oil-free this unique solution based on pure algae extract and hyaluronic acid offers a feeling of deep hydration and a sense of protection from dryness, makeup, and the environment. Neither serum nor toner, this antioxidant-rich powerhouse offers the feel of deep hydration in a featherlight formula for skin that feels instantly smoothed with just a few drops. Use day and night on cleansed skin before applying moisturizer. Place 5 drops in the palm of your hand then warm and emulsify with fingertips. Massage onto skin using an upward circular motion. Allow just a minute for fast-acting Nutrify to deliver results, then follow with moisturizer. For a feel of boosted hydration, keep Nutrify in the refrigerator. Apply before and after sun or wind exposure for a sense of cooling, non-greasy skin quenching.